02 | March | 2013 | Solid ground...are we there yet? Having spent much of my professional career in Latin America I have been greatly interested in the role that urbanization plays in economic and political development. Many of the trends that I have witnessed in Latin America are playing out all over the developing world. 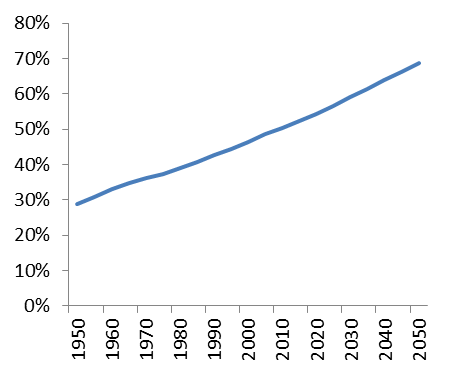 In fact by 2010, cities officially became the home of the majority of the human race, and the rate of urbanization is only increasing. 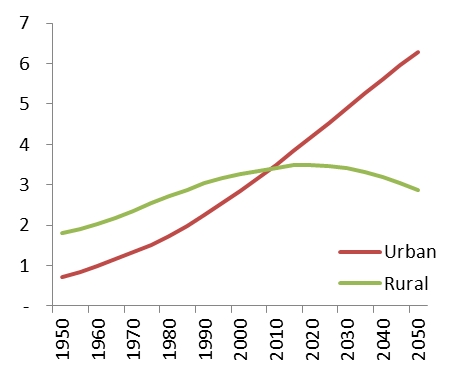 The graphs above show rural population worldwide plateaued in the first decade of the century, is expected to decrease over the next 40 years (UNPop World Urbanization Prospects 2009). Although the rural population is decreasing globally, poverty is still disproportionately represented in the worlds’ rural periphery. 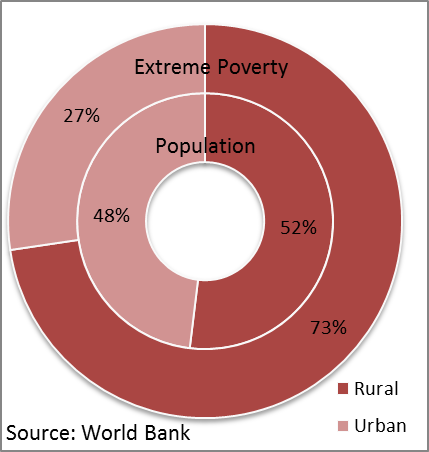 The chart and table below show this urban-rural disparity on the global and regional scale. Globally, just over 301 million people living in extreme poverty (< $1.25/day), about 27% of population in extreme poverty, are living in cities, whereas just over 3 billion (almost half) of the total population live in cities. 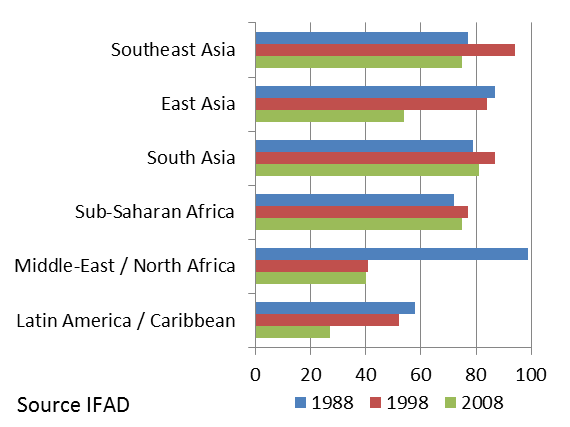 If we look at the break up of poverty regionally, we see the same disproportionate trend with rural poverty share of total poverty ranging from 27 percent in Latin America (around 20% of total population is rural) to nearly 80 percent in South Asia (70% of total population is rural). Urbanization also has many negative effects, especially in cities without sufficient infrastructure to handle the large influxes of new people. Managing this transition is undoubtedly of great interest to many developing countries. In the World Bank post, Massimiliano Cali makes a good point that investments in urban areas should be considered in the overall portfolio of pro-poverty and pro-rural investment. Just investing in rural areas, may lead to missed opportunities to harness powerful economic effects from urbanization. Nevertheless, due to the disproportionate amount of poverty in rural areas it will continue to be critical to invest in pro-poor strategies in rural areas. This doesn’t preclude spending some time and money on facilitating and easing the transition to more urban societies, but it must be balanced by targeted interventions to improve rural productivity. Increasing rural productivity has the double benefit of improving rural livelihoods, and stemming urban migration, buying time for heavily stressed cities to build up necessary infrastructure and social services. The recent food crises have highlighted the need for greater investment in agriculture, and to relook at the agricultural systems in the developing world. I believe this is a good thing, and that agriculture has not received the attention that it may deserve. I would love to see greater investment in agricultural extension, and improving the mechanisms of transfers of knowledge and technology in the developing world. However, I am also concerned that development practitioners working on poverty reduction tend to silo themselves off in either urban or rural spheres, which may lead to development interventions with tunnel vision and miss the urban-rural connections that a more holistic approach might exploit.